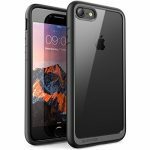 Appearance, ruggedness, grip, and size were the main criteria I had in mind when I read the many reviews of the SUPCASE Unicorn Beetle Style Premium Hybrid Protective Clear Bumper Case. This case seemed like the perfect compromise of function, fit, and appearance. According to the numerous reviews, users like the fit, size, and appearance. That is all I needed to know. One of the things I was looking for was a case design that would not hide the good, sleek looks of my new iPhone. I chose the Black iPhone 8 model because I grew tired of the white bezel of my previous, silver iPhone 6 which quite frankly made the screen look smaller and cheap. 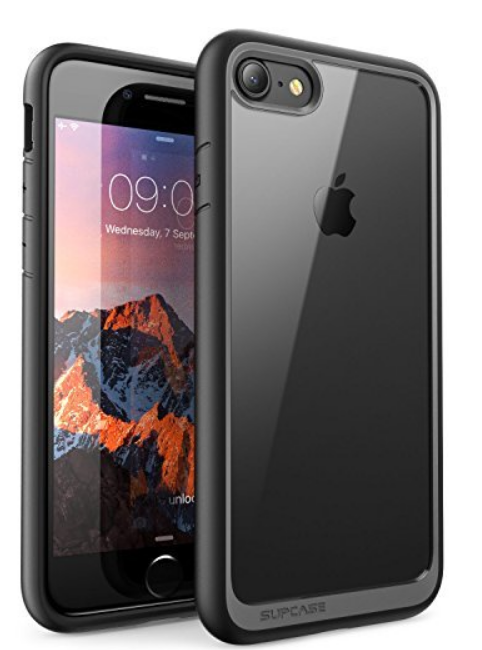 So, I wanted a black case that would fit snugly around the iPhone 8 without being too conspicuous. Based on user feedback, the SUPCASE Unicorn Beetle met all these criteria. I ordered it Next Day delivery because I didn’t want to risk using my new phone without a case for an extra day. Incidentally, if you’re an Amazon Prime customer, Next Day service is not such a good deal. I received the package at 5:10PM the next day and that is about as early of a delivery that I’ve ever gotten from paying the extra money for Next Day service. The two-day delivery usually gets it to me before noon. I will stick with that from now on. One of the problems with iPhone cases is that they take away some of the beauty of the latest phone designs. One of the attractive features of the iPhone 8 is the glassy appearance both front and back. The Unicorn Beetle has a scratch-resistant transparent back which preserves the beauty of the new, glass design. The transparent material is high enough quality that it actually looks like glass. 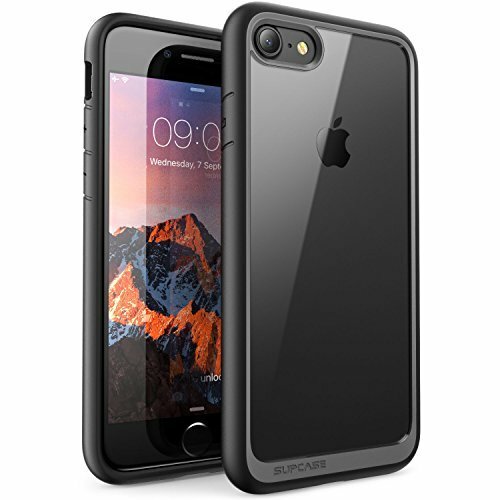 The rubberized molding is rounded keeping the case form factor as slim, sleek and close to the original design as possible, and blends seamlessly with the content on my black screen. The SUPCASE Unicorn Beetle is an attractive iPhone case. The Unicorn Beetle fits easily into my pocket yet is not so slippery that it will fall out. What I love most about this case is how well it is designed. The fittings around the power jack and camera allow plenty of room. When you set the case on its back you don’t have to worry about scratching your camera lens. The front of the case has just enough of a nice ridge around it to protect it from drops. 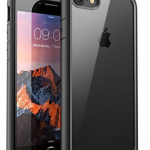 What really makes this the best iphone 8 case in my opinion, however, is the volume control and power button covers which are approximately thumb-sized and positioned perfectly for appropriate function without detracting from the size or looks of the case. You will have to hold one of these in your hand and actually use it to truly appreciate how well made it really is. Even the best things in life like iPhone cases are never perfect, but it’s pretty hard to come up with a dislike for this product without thinking outside the box a little bit. If I had to pick one and only one thing I don’t like about this case it is the brand name? SUPCOM Unicorn Beetle? Seriously? Why such an odd name that is so hard to plug in reviews or in the course of a conversation? I guess that is what is to be expected from an industry that brought us the name, Otterbox. Other than that, if I wanted to be real picky I suppose I could complain that the beautiful, back transparent surface is easily smudged with fingerprints. But, the same could be said without a case at all. That’s about it. If your criteria is like mine than I highly recommend the SUPCOM Unicorn Beetle as the best iphone 8 case you can buy.